Israeli Prime Minister Benjamin Netanyahu is to meet with U.S. President Donald Trump this week in Washington. The meeting comes as Netanyahu's Likud party is lagging in opinion polls ahead of elections next month. 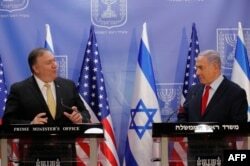 U.S. Secretary of State Mike Pompeo (left) and Israeli Prime Minister Benjamin Netanyahu deliver a joint statement during their meeting in Jerusalem on March 20, 2019. Netanyahu also thanked the United States for walking away from what he called the “disastrous” Iran nuclear deal.